- what do you guys think of the unifence? Will upgrading to biesemeyer fence be worth it? A Unifence is just as accurate as any Biesemeyer fence, and it knows a few tricks that the Biese doesn’t, so I’d keep it. 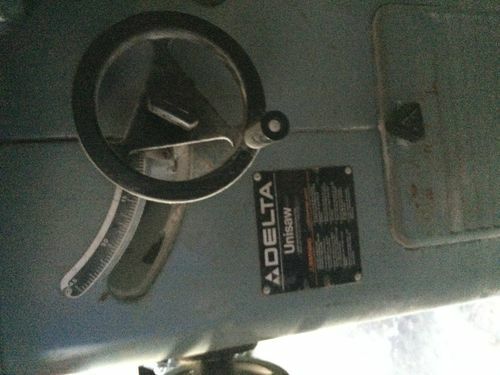 Belts have to be matched sets… You should be able to get them from any Delta parts dealer, or even Grainger. An auto parts store probably won’t have them. Don’t use link belts on multi-belt systems. I like dry lubes for exposed gears… Sealed bearings are just that, sealed, and you can’t really lube them from the outside without attracting a lot of dust and gunk. Does that saw have grease fittings? Welcome to the Unisaw club. Parts can be obtained from lots of different places, depending on what it is you need – and some things, like the motor cover and throat plates can be made easily yourself. For lube, don’t use grease. A good dry lube or paraffin/paste wax works fine and won’t attract sawdust. No, you don’t absolutely need the Delta branded matched set of belts. A set of A24/4L260 (or AX if you want cogged) can be sourced from lots of places. I wound up getting a set of Jason Unimatch belts online (total cost with shipping was about $13) simply because I couldn’t find a local store that carried three of anything. The Unifence is a great and much sought after fence. I’ve known people who replaced their Biesemeyer with one, and also have seen people replace the Unifence with a Biesemeyer. Give it a try for a while and see how you like it. You can always re-sell it for about what you paid for the saw if you decide to swap it out. Keep the Unifence. You can’t retrofit a riving knife to those saws, but splitters are easy to make. Don’t worry about a blade guard, you’ll end up not using it anyway. This sounds like my first, right tilt Unisaw. I now am using my second, a left tilt. 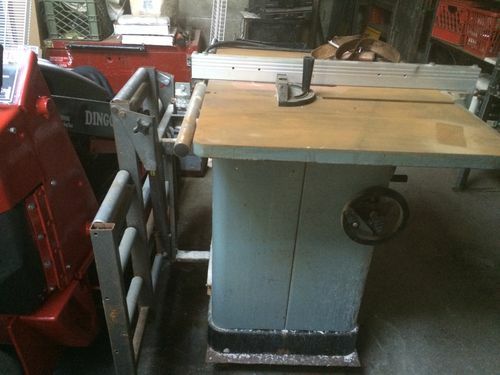 In the forty plus years I’ve had a Unisaw, I use/used Unifences on both my saws. They are no less accurate than any other fence. As others noted, they can do tricks, such as sliding back to use them as stops, when using the miter push, or flipped to make trimming laminates. I did buy an after market to slide onto my Unifence mount, because it holds hold downs and such, which can be moved anywhere on the fence. For a splitter, I use a Merlin Splitter. It goes on and off in seconds and has cut down kick backs from the wood pinching the back of the blade to almost nil. Used with a push block/shoe, rather than a [BS] stick, I have been able to kill the machine before any real event occurred – and my hand was well up and away from the danger zone. As others stated, buy a matched set. It doesn’t matter who from, as long as they match OEM. I never use the factory throat plate in cutting operations. Its only function is to produce disposable plates. For a blade guard, I have an Excalibur, which doubles as a dust collector. I even use is once in a while, when doing wide stock, or if the hold downs will allow me to forego a push shoe. NOTE: I used an associates Biesemeyer and it was fine too. The only reason I ever considered one was, I bought the Ford vs Chevy arguments back when I was starting out. Since then, I’ve come to realize it is just Ford vs Chevy. Quite a few Unisaw parts are offered on Ebay. If you need to work under the saw for some reason, such as changing belts, try tipping the saw. I did this very recently. Propped it up with about a 4” block to tilt it. Makes it much easier to work. If you’re concerned about tipping it over, put a prop on the other side. Thanks for the quick response guys I really appreciate it. I am not sure if it has grease fittings since it’s still sitting in the guys shop. I broke my leg some few months back and am just starting to walk. I didn’t want to risk pushing it trying to load the saw on my truck. I am sending three of my employees in a couple of weeks to pick it up. Luckily I have a project a few miles up the road so they have to go there anyway. My dad told me he has some blade guides that were custom made in Europe for the unifence back in the early 80’s sitting in storage. I didn’t know the unifence was that good. I am gonna go and grab my dads. He has the fence, the stock rails, some super long rails and a motor he rebuilt in 94 but never used it sitting in storage as well. His saw is beat to hell the storage unit had a tiny plumbing leak that dripped a few drops on the saw per day for over 20 years. The cast looks like wet newspaper. I literally broke one of the extension wings in half like a cracker. Luckily he had the motor and rail parts off the saw and up on a shelf. Can someone explain the fence tricks to me? I got the fence name wrong. It’s not the unifence it’s the jetfence. Ugh, different ball of wax entirely. The Jet Lock is usable but it’s worth the money to buy a better fence. Jetlock fences are not great. Definitely will want to replace it with any of the bessy clones. You are looking at 300 dollars or thereabouts. If a motor sat unused exposed to regular humidity changes etc for 20+ years there is a good chance the bearings are dried out. You will want to replace them before swapping that motor out if that is your intention. i’ve heard that a lot, but the unisaw i refurbbed and opted to sell has a jet lock that was as accurate as my t2 ans ridgid OEM fences. I remember using the jet lock when I was a kid and it was pretty good. I am a contractor and accustomed to the cheap fences on the job site saws so this is probably a huge step up but I really do want a fence that I can rely on. I was just thinking of holding on to the motor in case mine ever went bad but I don’t foresee that happening. I was really impressed by how quiet it was. I am itching to get it home and clean it up. Oh there’s no way I was gonna let this opportunity pass. 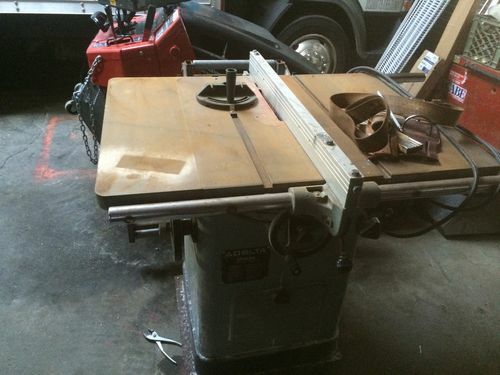 I purchased the saw and a bunch of oak scraps for $325.